Phnom Penh (VNA) – A monument dedicated to Vietnamese volunteer soldiers was inaugurated in Phnom Penh, Cambodia, on October 27 after a period of restoration. The inaugural ceremony was jointly held by the National Council of the Solidarity Front for the Development of Cambodia’s Motherland, the Phnom Penh City Hall, and the Vietnamese Defence Attache Office in Cambodia. Speaking at the event, Deputy Minister of State at the Cambodian Ministry of Cults and Religion Ngem Valy highly appreciated efforts made by relevant sides in restoring and embellishing the monument in Phnom Penh and others in localities in Cambodia in general, saying that those contribute to strengthening the Vietnam-Cambodia relations. He thanked Vietnam’s Party, State, Government, National Assembly and the Vietnam Fatherland Front (VFF), soldiers and their families for helping Cambodia escape from the Pol Pot genocidal regime . 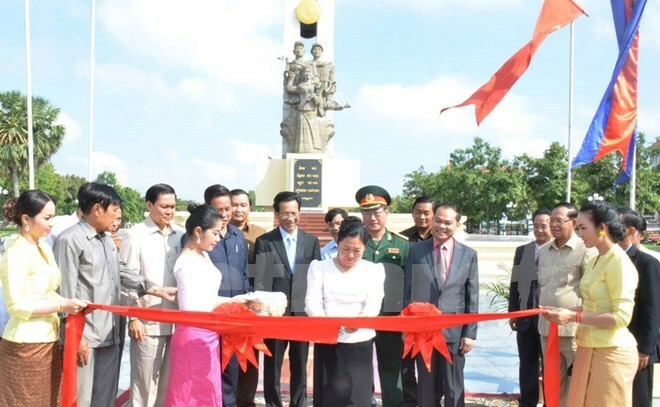 Colonel Nguyen Anh Dung, head of the Vietnamese Defence Attache Office in Cambodia, said the monument is a symbol of the Vietnam-Cambodia friendship and a reminder of Cambodia’s hardship times in the past, adding that it will help educate both nations’ young generations on the bilateral ties. Previously, at their working session in late 2013, Cambodian Prime Minister Samdech Hunsen and President of the Vietnam Fatherland Front Central Committee Nguyen Thien Nhan agreed on a plan to restore and upgrade 17 monuments to Vietnamese volunteer soldiers across Cambodia. The Solidarity Front for the Development of Cambodia’s Motherland has coordinated with the Vietnamese Ministry of Defence to implement the work.